A promotional item that is both useful and practical, this Ceramic Mug with Lid And Sleeve giveaway is an all-year-round merchandise you can have by your side as a reward or incentive. A single-walled drinking cup with a 400 ml liquid capacity, it comes with a silicone lid and matching wrap band. Available in 6 lovely colours, it is dishwasher safe and will make a thoughtful gift to coffee or tea lovers. 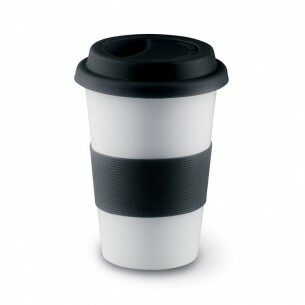 Our ceramic mug w/ lid and sleeve is made from ceramics and is available in black, blue, red , grey, orange, lime. The main print position on this product is the front. Please chat to us if you would like to use another position. This tumbler product is printed in up to 2 colours via ceramic transfer print, which is a technique suitable for all ceramic items.